Come with me as I travel the valley from above Llyn Tegid to the sea, and share my discovery of sturdy bridges, beautiful bridges, mysterious bridges. The Dee valley is a visual delight, an artist's paradise that I thought I knew well. But this enterprise took me to unfrequented places where 300 year old bridges still maintain vital crossing points for the rural communities, while better known structures provide their own surprises. 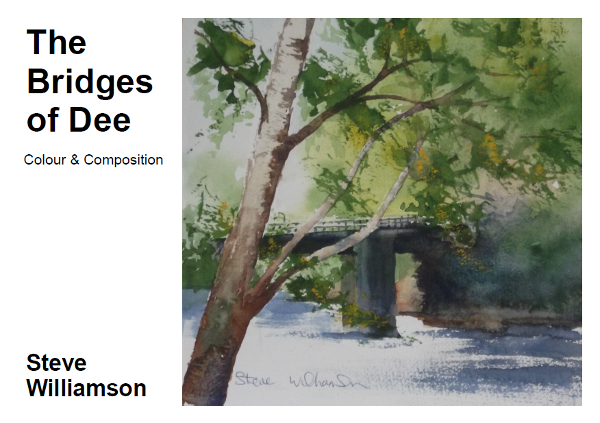 There are 41 bridges over the Dee and I set myself the task of painting every one of them - well, I wanted to improve my compositional skills, didn't I? Painting notes accompany every picture in the the book so that you can work beside me as I go - and it seemed worthwhile to research the stories and legends of the bridges and the surrounding countryside and share them with you, too. Appropriately for a book about bridges over the Dee, it has been printed in Wales by Gomer Press Ltd, a company specialising in books of photography and fine art. To order a copy (or two, or more!) please complete the following fields to send me an e-mail and provide your correct e-mail address in order to receive a reply. Details on how to pay follow the email form, including bank details for transfers, and an address if you prefer to send a cheque. In figures, what is nine plus 4? Copies cost £20.00 each, including postage and packaging within the UK. Please email for postage rates to Europe and beyond. Except in exceptional circumstances payment must be received before any books are dispatched. Please make cheques payable to Solipsys Ltd. Note that payments are processed by hand and may take a couple of days to appear. Send cheques to: 7 Plover Close, Farndon, Chester, CH3 6RG. Bank Transfer: NatWest Sort code: 60-05-07 Account: 23868686 IBAN: GB08NWBK 600507 23868686 BIC: NWBKGB2L, quoting reference "Bridges Of Dee".